Ease of management for marketing and breeding purposes have led two neighbouring Northumberland sheep producers to use the same automatic electronic tagging system. 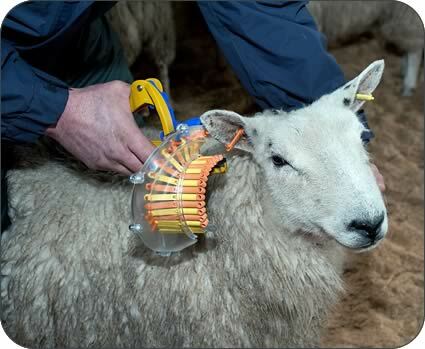 David Ashbridge first began using an automatic sheep tagging system in 2002 when he worked for a neighbouring farm and since taking on the tenancy of Wingates Moor Farm near Rothbury where his father Joe was previously manager, he has continued to use them. Convinced the automatic electronic tagging system is the way forward, he introduced Selkirk-based Roxan’s TagFaster system to neighbour Jimmy Bell ‘The Lamb Man’ who markets his own finished lamb and was wanting to identify the ewes and rams which performed the best. “I have used a variety of Roxan’s tags for breeding stock over the years and they have all done the job. Brian Eadie is always looking to make improvements on the tags,” said David, who farms 236 acres at Wingates Moor and rents additional land and lambs 700 Texel cross and Mule ewes to the Texel ram. Brian Eadie has been designing and manufacturing sheep ear tags for the last 20 years and since re-entering the sheep tag market in 2010, after three years absence following the sale of some original tag designs, his company, Roxan, is fast expanding again, and it has already gained a reasonable share of the UK market. Exports of his new designs are reaching New Zealand, Denmark, Italy, China, Canada, USA, France, Estonia, and Australia. David also uses electronic slaughter on all of his lambs from late June to the end of the year with lambs tagged just before they are sold. Depending on the trade, some are sold finished through Acklington mart where in March this year they were among the top prices to average £77 a head and up to £85. Others go through the store ring at Hexham where they are identified in the catalogue as being electronically tagged which aids management and traceability for the buyer-finisher. “When the lambs go through the store ring it’s an advantage to the buyer for them to be electronically tagged. A specialist finisher may be drawing lambs purchased from 20 different farms and instead of having to look at the UK number on the tag he can easily read the tags with an electronic reader to get the information for his movement sheet,” said David. 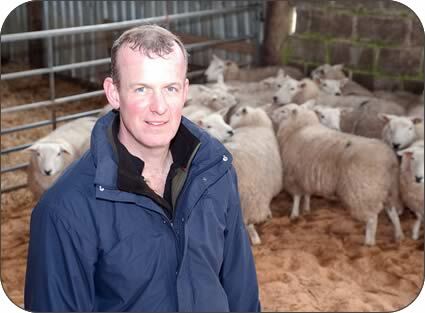 By improved management and selecting the best ewes, David has lifted the flock’s lambing performance by 15% to 182%. Ewes are scanned and with the tups out for only two cycles the lambing which starts on March 22 is finished after 17 days, with the exception of 25-30. “With the tags we have used in the past, we have had to be so careful that the EID tag and the yellow management tags have the same number,” said David. “TagFaster’s unique system of ‘twins’ which are a yellow EID tag and a year code visual pairs the tags in a strip of 20 so there is no way we can get the numbers wrong,” he said. The tag applicator gun is quick to use and David uses a crate with a self locking yoke. He can take up to 50 in 15 minutes. “It has easily halved the time. It used to be a big job using two piece tags. 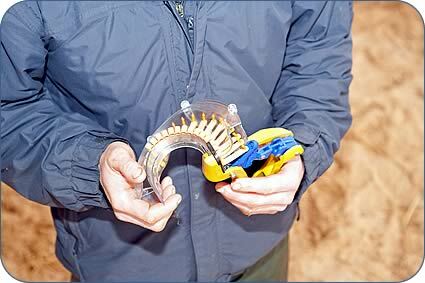 It is very quick to slot another strip of tags into the applicator,” he added. Improvements by Roxan have strengthened the tag pin while keeping its size to a minimum which along with a ‘bridge’ design to maximise ear space, helps prevent sores which then attract flies. Jimmy and Kirsty Bell at neighbouring East Wingates Farm were persuaded to try electronic slaughter tags to monitor the performance of their rams and ewes to help maximise carcase quality of the lambs they sell direct to the public. 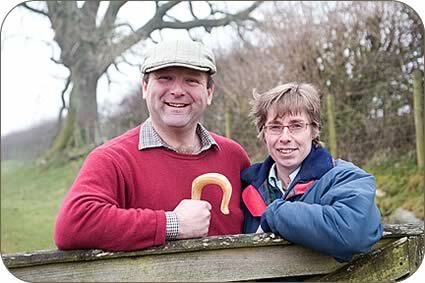 The couple diversified their farming business in 1999 when they converted a farm building into a butchery and cold store so that they could produce, butcher and sell their lamb to customers at farmers’ markets and via the internet, www.thelambman.com. The farm has been in Countryside Stewardship for 20 years and is now undergoing organic conversion. The closed flock of three quarter bred Texels is closed with numbers running at 200 ewes and 50 hoggs which are being built up to the size of the flock previously at 400 ewes. It is traditionally managed. “We wanted to record the performance of rams in particular. We bought a high index Charollais cross Texel ram from the Logie Durno flock, Aberdeenshire and we wanted to easily record which rams went with which ewes and how they performed for the butchery business,” said Jimmy. The Bells also invested in a TGM Software Solutions electronic tag reader which can then transfer data back to the farm’s computer. Kirsty has the post lambing system off to a fine art, armed with rubber rings, iodine spray and tagging applicator gun which she carries in a bucket between the individual lambing pens. The lambs are slaughtered locally and while individual animals cannot be identified by their carcase, the information from the tags from batches of lambs slaughtered is enabling the Bells to see which lambs are finishing soonest, how good their eye muscle is and monitor the right amount of fat cover. The Charollais cross Texel ram tupped 73 ewes this season with the rest covered by Texel rams bred in the north east by Hans Porksen and Donald MacPherson. The flock scanned 181% and last year it made 163% lambs sold. “We like to have a few single lambs which we start selling at the farmers markets from mid August. After that we are slaughtering lambs every week until the third week of February. We like to keep our customers happy and provide them with ‘proper’ lamb. We hang the first lambs for a week and then for a fortnight later in the year.” said Jimmy.